My suggestion to new converts, particularly from evangelical protestant expressions is this: DON”T BECOME A PART OF THE DREADED LOCAL LITURGY POLICE! (DLLP) I can’t emphasize this enough as I have seen good solid evangelicals become good solid Catholics because protestantism wasn’t enough, but then before you know it, basic Catholicism wasn’t enough, so then they sought the tridentine mass (which is fine) but then before you know it, the novus ordo mass is barely licit and most Catholics in this parish are "sheeple" and the "bishop in my diocese are so liberal" and "Vatican 2 may or may not have been a valid council." This then leads to…sedesville, (sedevacantism) where the Church is not the Church and you have appointed yourself to know which popes are the valid ones…. this ultimately leads back to protesting, again, a full circle. No, not Willy Wonka and his delicious chocolate confections. Wonky people. Confused people, ones who do not believe in the Church’s teachings. Sometimes they are priests and nuns; sometimes liturgists and organists; sometimes Joe Catholic next to you in the pew. It can be a shock to the system to encounter such persons, especially since you gave up a lot to become Catholic and can scarcely imagine why someone would remain in the Church who rejected her divine authority. Yet these persons exist, in need of prayer and love. Give them that, but do not let your faith be shaken by their doubts. I can understand the concerns of both of these bloggers. On the other hand, I wonder if both of these bloggers are themselves aware of how still functionally Protestant they both are. Both of them are subjectively interpreting the Roman Catholic Church and assume their insights are the correct interpretation of all things Roman. For the first blogger, he's protesting against protesters. The second blogger appears to think he can correctly interpret the magisterium while certain priests and nuns cannot. In essence, it's his interpretation of Roman Catholicism versus someone else's. And also write down the thoughts and emotions you have experienced in converting. Write down your mindset as a Protestant and how the paradigm shift occurred that led you to become Catholic. The central part of it is mysterious, unquantifiable, hidden in the heart of God and His grace. But you can commit to paper (or electronic ink) as much as you comprehend. It will be valuable later, for you certainly, maybe for others. You could start a blog right away if you feel called to. Or just jot them down on paper, or save them on the computer. Whatever medium you like is fine; the important thing is just to do it. It is easy to start forgetting (quite quickly) what it was like to not be Catholic. For those people who use conversion stories as apologetic tools, I've decided to be helpful this morning, or rather, a bit ecumenical. Based on the template paragraph above, I've taken the time to prepare a few different versions of this paragraph to be cut-and-pasted by any who would like to use it on a blog. And also write down the thoughts and emotions you have experienced in converting. Write down your mindset as a Chrsitian and how the paradigm shift occurred that led you to become Muslim. The central part of it is mysterious, unquantifiable, revealed by the prophet Mohammed. But you can commit to paper (or electronic ink) as much as you comprehend. It will be valuable later, for you certainly, maybe for others. You could start a blog right away if you feel called to. Or just jot them down on paper, or save them on the computer. Whatever medium you like is fine; the important thing is just to do it. It is easy to start forgetting (quite quickly) what it was like to not be Muslim. And also write down the thoughts and emotions you have experienced in converting. Write down your mindset as a Chrsitian and how the paradigm shift occurred that led you to become Mormon. The central part of it is mysterious, unquantifiable, hidden in the heart of God and revealed by Joseph Smith. But you can commit to paper (or electronic ink) as much as you comprehend. It will be valuable later, for you certainly, maybe for others. You could start a blog right away if you feel called to. Or just jot them down on paper, or save them on the computer. Whatever medium you like is fine; the important thing is just to do it. It is easy to start forgetting (quite quickly) what it was like to not be a member of the Church of Jesus Christ of Later Day Saints. And also write down the thoughts and emotions you have experienced in converting. Write down your mindset as a member of a central religion and how the paradigm shift occurred that led you to a species of extraterrestrials called the Elohim. The central part of it is mysterious, unquantifiable, hidden in the heart of the Elohim revealed by the prophets and spaceships they send to earth. But you can commit to paper (or electronic ink) as much as you comprehend. It will be valuable later, for you certainly, maybe for others. You could start a blog right away if you feel called to. Or just jot them down on paper, or save them on the computer. Whatever medium you like is fine; the important thing is just to do it. It is easy to start forgetting (quite quickly) what it was like to not be a member of the Raëlian Church. Conversion stories are powerful. As an Evangelical we called them testimonies, and they pointed to Christ and His abounding grace. So I don't see a problem with them being an apologetic tool. Yes some priests, nuns, Catholics don't believe in the Church's teachings. But the problem most often is not their subjective interpretation, but simple disobedience. So the Church says to priests: when celebrating the Mass, say these words and do these actions. And some wonky priests don't say those words (or don't say all of them, or change them) and do different actions. Or the Church teaches: women cannot be priests. But some Catholics want women to be priests. So they say women can be priests. A and ~A. This is not hard or subjective. It's just rejecting the Church's teaching authority. So it is actually the people who say ~A when the Church teaches A that are Protestant in their thinking. The Church's Magisterium is a living one, and she hears questions and can answer and even clarify them over time. The Bible alone cannot function in that way, wasn't meant to. "Roman Catholics Who Are Functional Protestants"
Saved in spite of Church teaching, not because of it! I don't think this is a question about being saved. It's a question about obedience to authority. We aren't questioning their salvation--only God has that ability. I agree with Devin...Catholicism says A...you do A.
I've stated this in another post here but this isn't done because of submission to a man. This is done out of love for Christ--specifically in the Eucharist. Through the love of the Eucharist, I willfully submit to the obedience of the Magisterium and their understanding of Scripture. But the problem most often is not their subjective interpretation, but simple disobedience. Same for Protestant disunity and all - the problem is not their subjective interpretations, but simple disobedience. "The Church's Magisterium is a living one, and she hears questions and can answer and even clarify them over time. The Bible alone cannot function in that way, wasn't meant to. " The RCC Magisterium does not solve the problem, as you admit. -secretly and in addition to the Scriptures. Another way that Roman Catholicism is similar to Gnosticism in its understanding of oral, secret tradition. "1. 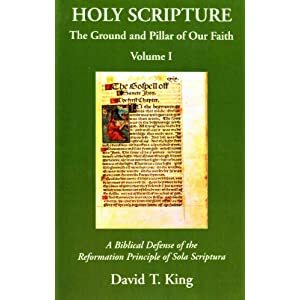 When, however, they are confuted from the Scriptures, they turn round and accuse these same Scriptures, as if they were not correct, nor of authority, and [assert] that they are ambiguous, and that the truth cannot be extracted from them by those who are ignorant of tradition. For [they allege] that the truth was not delivered by means of written documents, but vivâ voce: ,wherefore also Paul declared, "But we speak wisdom among those that are perfect, but not the wisdom of this world. "4 And this wisdom each one of them alleges to be the fiction of his own inventing, forsooth; so that, according to their idea, the truth properly resides at one time in Valentinus, at another in Marcion, at another in Cerinthus, then afterwards in Basilides, or has even been indifferently in any other opponent,5 who could speak nothing pertaining to salvation. For every one of these men, being altogether of a perverse disposition, depraving the system of truth, is not ashamed to preach himself." This is nothing similar to what Irenaeus spoke about. The Church holds to the Tradition of the Apostles and answers new questions (e.g. Stem Cell research or in vitro fertilization) through the lens of what the Apostles taught. I'm the former evangelical seminarian featured in Devin's post. Glad to see people discussing it. I don't want to be redundant to earlier posts, but describing obedience to the Catholic Church as subjective interpretation doesn't ring true to me. There are many ways to question the legitimacy of the Catholic Church--defending sola scriptura and disproving aposotolic succession made/make the most sense to me--but calling something like obeying church teaching subjective isn't where I would start. the Presbyters of the churches at the time of Irenaeus are not the same as the Roman Catholic Magisterium created centuries later and slowly developed for many more centuries and in finally declared as infallible in 1870 AD -a massively arrogant clam; as Boniface VIII's haughty statement in Unam Sanctum of 1302 AD and Pius IX's statement "I am tradition", etc. and very late and far removed from the first 5-6 centuries of Christian history . So, no, you don't get to claim Irenaeus of around 180-200 AD for this at all. It is exactly what Roman Catholicism does - it claims secret oral tradition was taught by Paul and the other apostles - like Marian dogmas and Papal doctrines and indulgences and Purgatory and Transubstantiation, and yet was not written down, and then just "comes out" centuries later in some priest or bishop or other church father/ writer in 500 or 800 or 1300 or 1215 or 1545-1564 or 1854 or 1870 or 1950 AD. Saying "the Magisterium" is your gloss. You need to argue for that assertion from Irenaeus, not add it on. That could just as easily be speaking of the preaching of the apostles that was contained in the NT. “It is within the power of all, therefore, in every Church, who may wish to see the truth, to contemplate clearly the tradition of the apostles manifested throughout the whole world; and we are in a position to reckon up those who were by the apostles instituted bishops in the Churches, and [to demonstrate] the succession of these men to our own times” (Book III, Chapter 3, Paragraph 1) He even makes references to “hidden mysteries” would have been given to the bishops before anyone. Not only that, but then he talks about the Papacy in paragraph 3 and the primacy of Rome (“the Church in Rome dispatched a most powerful letter to the Corinthians, exhorting them to peace, renewing their faith, and declaring the tradition which it had lately received from the apostles”) along with LISTING the first 12 Popes. I can read Irenaeus today and agree with all of what he’s saying…it is still valid today. The Catholic Church hasn’t changed it’s teaching. You can still find what he wrote still concurs with the Catechism. I don’t think you can do that. The institution of bishops doesn't do anything to rebut my point. He even makes references to “hidden mysteries” would have been given to the bishops before anyone. So what if he says the church was founded at Rome? How does "very great", "very ancient", and "universally known" translate to infallibility, primacy, special charism for a Magisterium? How does my argument not account for this statement? along with LISTING the first 12 Popes. BTW, does he call them "Pope" or "bishop of Rome"? And it'd be a measure of either his willingness to tell the truth or his knowledge to know whether he mentioned the originally-present plurality of elders in Rome? That Jesus died at the age of 50? The Catholic Church hasn’t changed it’s teaching. Irenaeus is not The Church. You can still find what he wrote still concurs with the Catechism. I don’t think you can do that. Even if that were true (which it isn't), it makes literally zero difference to me, for Irenaeus is no authority for anyone. Rather, Scripture. I don’t know. They’re hidden. This tells me that the bishops have handed down the truth from Christ to the time of Irenaeus. The truth is preserved through the bishops the same as it is today. If it’s truth, then it’s not wrong. If it’s truth, it’s infallible. Why does Rome dispatch it? Why not some other bishop from another city? Why not another Church? Why didn’t they just go to Scripture? I don’t know how old Jesus was when He died. Do you? Does it say in Scripture? Maybe He was 50. In any case, that’s not important to my faith. I agree with Irenaeus that Scripture is the ground and pillar of our faith. The Catechism tells us that we should venerate Scripture as we do the Lord’s Body (CCC 103). I also believe that the Church (through the Magisterium and Tradition—as per what Irenaeus says in Chapter 3) is also the ground and pillar of our faith (as per Scripture). Then why reference him in the combox? If you don't know what those hidden things are, how are they important in this discussion? The "vivifying faith" statement fits in quite well with my position. Also, you're confusing "true" with "infallible". Ideas, propositions, are true (or false). People and communicatORS are infallible (or fallible). So "if it's truth, it's infallible" is a category error and unhelpful for our discussion. I have no idea why Rome dispatched it. That's just what happened. What if they were the ones who knew about it? It's not as if contemporary communication was that great, and Rome was a seriously centralised location, a big hub. What if the church in Corinth didn't have all the Scripture at that time? Why do you think that having Scripture rules out or makes superfluous churches exhorting and correcting each other? So did Irenaeus mention the original plurality of elders in Rome or not? It clearly says that Jesus began His earthly ministry around the age of 30 in the NT. No, He most certainly did not die at age 50. I knew you were going to say that - you disingenuous Rome disciples are so predictable. You said you agree with all of what Irenaeus said. He said Jesus died at age 50. You don't believe Jesus did. You were wrong. Now, withdraw your statement and concede that you were wrong. Do the right thing. If you think the church is the ground and pillar of our faith, why did Irenaeus say the Scripture is? I am talking about Irenaeus b/c you think it's important. It's an internal critique, showing that even if I unnecessarily grant quite a lot of ground here, you still can't sustain your position. That's because RCC is flat out wrong. You asked me to name them. I’m saying I don’t know what they are. I was responding to Ken’s thoughts about indulgences, Purgatory, Marian dogma, etc. Irenaeus is telling us that these men are “preaching of the truth.” So, when these men speak (which the Church holds only in Church Councils and/or “ex-Cathedra”), they speak truth. If it is truth, then they are infallible. I believe this not because Irenaeus says it but because of my faith. I have no idea why Rome dispatched it. That's just what happened. What if the church in Corinth didn't have all the Scripture at that time? I can assure you they didn’t because the New Testament hadn’t been canonized yet. All they had was the Bishop of Corinth and the elders. I’m sure they had letters but they didn’t know which ones were canonical or not…at least until someone deemed them canonical. Why do you think that having Scripture rules out or makes superfluous churches exhorting and correcting each other? I don’t. I think Rome had to give them the proper understanding of Church teaching. They couldn’t just refer to Scripture. Scripture (at least the NT) didn’t exist yet. Rome had to correct them. I believe that Jesus was around 33 when He died. I don’t know that for sure. I know that in John, the Jews said He was “not quite fifty” does that mean he was almost fifty? I don’t know. It doesn’t say in Scripture and it’s not pertinent to my faith. That’s funny! Buildings can (and usually do) have more than one pillar. I believe in three pillars. Scripture, Tradition and Magisterium. All three are derived from the Church. I don’t see a conflict with this. I am talking about Irenaeus because Ken brought him up in the combox. If Ken wants to reference Irenaeus, then Ken should believe what Irenaeus says in everything (particularly the very next paragraph and chapter). The RCC is the fullness of Truth and I can sustain my position quite well.